Called the “Prince of Entertainers” and the “Entertainer of Princes,” John Cummins was a prosperous businessman known for his generous and lavish hospitality to royalty and commoner alike and for his knowledge and love of Hawaiian traditions. John Adams Kuakini Cummins was born on O’ahu on March 17, 1835, the son of High Chiefess Kaumakaokane Papali‘ai‘aina and Thomas Jefferson Cummins, Jr. He was a namesake of island governor John Adams Kuakini (1789–1844,) who in turn took the name of John Quincy Adams. His mother was a descendent of the Lonoikahapu‘u line and was a cousin of King Kamehameha I. His father was a wealthy and aristocratic Englishman, born in Lancashire and reared in Massachusetts, who came to the Islands in 1828. Cummins was a staunch monarchist, who, in his later years, was arrested, tried, imprisoned and heavily fined by the new Republic of Hawaiʻi. 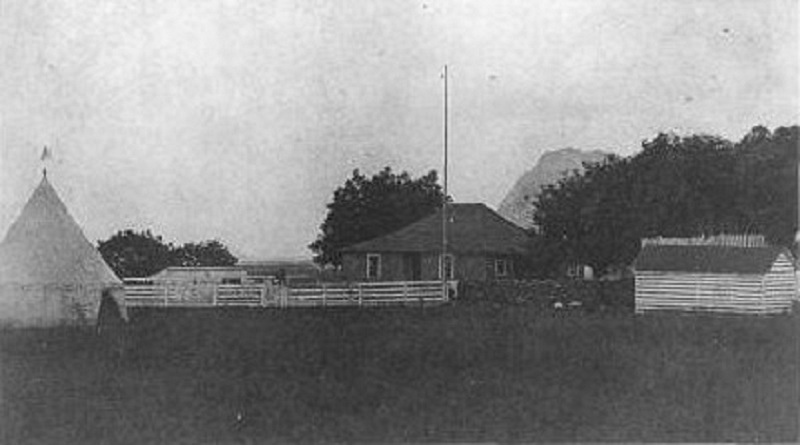 Thomas Cummins purchased or leased lands known as the Waimanalo Sugar Plantation; the first record of this was March 27, 1842, when High Chief Pākī leased Cummins a parcel of land on which to build a house. However, it was Mauna Loke, the family home in Waimānalo that was the scene of lavish Hawaiian-style living and entertaining that was synonymous with Cummins’s name. It was said that the food served there excelled that of the best in San Francisco, and the wines were of the choicest vintage. Although always offering plenty to drink, Cummins himself never touched a drop. His guests included royalty, starting with Kamehameha V, as well as foreign visitors. This included German Princes and the Duke of Edinburgh in 1869. King Kalākaua often enjoyed Cummins’s hospitality at the spacious home. There were several grass houses scattered throughout the grounds, one for the exclusive use of Kalākaua and one exclusively for Princess Kaʻiulani. As a child, Kaʻiulani helped “Uncle John” erect a flagpole nearby, then she raised the Hawaiian flag and christened it with a bottle of champagne. King Kamehameha V also liked to visit Mauna Loke. In order to avoid the difficult trip over the Pali trail, the king purchased a small steamboat in which to ride around the island from town and had a short railway line installed from the boat landing to the house. A huge celebration took place at Mauna Loke in November 1874, the first stop of a two-week “Grand Tour of O’ahu” by Queen Emma. The queen stayed three days, by which time the number present – both invited and uninvited – was in the hundreds. Guests brought food by the wagon load: hogs, bullocks, ducks, turkeys and poi. There were fireworks, bonfires, swimming, surfing, stream fishing, lei making, horse racing, rifle shooting and hula troupes performing one after another until daylight the next day. Cummins then escorted Emma on the rest of the tour around the island. Cummins was elected representative for his Koʻolau district in 1873 and assisted in the election of King Lunalilo that same year. The following year, he aided in the election of King Kalākaua and eventually served as Minister of Foreign Affairs. Cummins was instrumental in helping King Kalākaua effect a reciprocity treaty with the United States in 1874, after which the sugar industry prospered and the value of Waimānalo Plantation was greatly enhanced. The image shows Mauna Loke; in addition, I have added other images of Mauna Loke, John Adams Cummins and related in a folder of like name in the Photos section in my Facebook page. Mahalo for posting this..my family has lived in Mauna Loke since 1986 to now 2014. This home has honored my husband Wallace Klein and our family with memories and happiness. I dedicate this small message to my husband Wallace who passed away on Oct 24, 2013. We celebrated his life here on Dec 30th one day before our 33 years of being together at Mauna Loke with hundreds of people, lavish foods, with laughter and love. 3 of our 6 children were born in this home…I love you Wallace, you gave me more than love, you gave me a legacy of life. Hello! Not sure if you remember me but I used to live on the other side of this great house and often visited with you all. In fact your youngest daughter often gave me hula lessons on the wrap around porch. My name is Rackael and I have red curly hair and used to work at sea Life park. I’m so so sorry to hear of your husbands passing. Sending you lots of aloha.